Neptune's Defenders: Little-known Gulf Manta Rays Affected by Oil Spill? Little-known Gulf Manta Rays Affected by Oil Spill? In the weeks after the April 20 disaster, aerial photos and reports from boaters placed at least some mantas in the thick of the surface spill. But it's the oil's unseen impacts, deep underwater, may be even more troubling, especially as preliminary studies suggest the spill isn't going away. Mantas are filter feeders that reach huge sizes in part by taking in seawater and ejecting it through their gills, retaining plankton or other tiny creatures, according to Rachel Graham, lead shark scientist with the Wildlife Conservation Society's Ocean Giants Program. "Gill filaments, which enable mantas to extract oxygen from the water, are very vulnerable to any kind of toxin or oil coverage," Graham said. "If they are covered, they will likely die." What's more, there's so little known about Gulf mantas that scientists aren't sure if the 20-foot-wide (6-meter-wide) fish belong to one of two known manta species—or if the Gulf mantas are their own species altogether. After burning and sinking last April, the damaged Deepwater Horizon wellhead released nearly five million barrels of oil into the northern Gulf of Mexico (map). Each barrel equals 42 gallons, or 159 liters, of oil. The oil could affect the "ways mantas live their day-to-day lives for years," said marine biologist Andrea Marshall of the Mozambique-based Foundation for the Protection of Marine Megafauna. "It won't clear up over a few months." For instance, oil—and dispersants used to break it up—might hurt the rays' plankton food sources, as well as the "cleaning stations" where mantas go to have their parasites eaten by smaller fish. Oil could also disrupt mantas' migrations throughout the Gulf, or even their reproduction—no one knows where the animals give birth, according to Mexican marine biologist Silvia Hinojosa Alvarez of the Mexican Caribbean Manta Project. "The main problem is that we know [very little] about their biology," Alvarez said. "So how can we predict with accuracy what will happen?" Complicating matters is the Gulf's role as a manta hot spot. Fortunately, well-known Gulf manta haunts such as Flower Garden Banks National Marine Sanctuary were not in the direct path of the oil, said the Wildlife Conservation Society's Graham. However, "we have this huge threat of a deepwater oil spill, but [we] don't know any population sizes, and we have no baseline," she added. "So it's very difficult to estimate the impact of something like this." 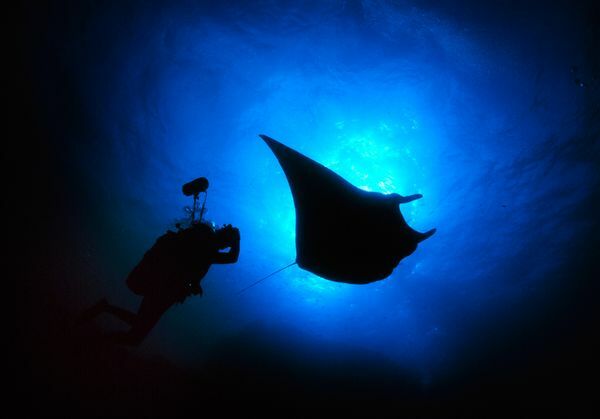 In addition, scientists believe that mantas are likely found throughout the Gulf. "So while those at the Flower Gardens may not be directly impacted, they may also move into areas affected by the spill," said Tim Clark, a marine ecologist with the National Park of American Samoa.